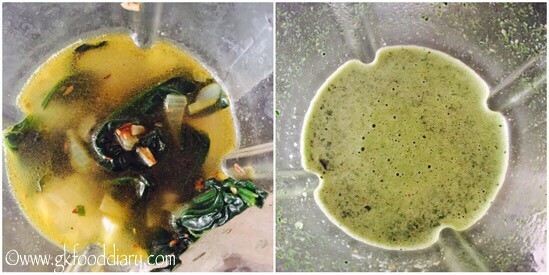 Spinach Soup/Palak Soup/ Keerai Soup – Easy, tasty, and healthy soup with spinach. 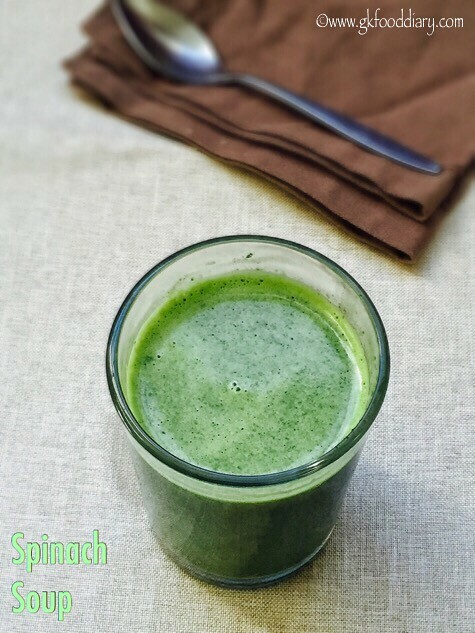 Everyone agrees that spinach is good for health as its packed with iron and vitamins. But if you have trouble including this healthy leafy greens in your children’s diet, then you should try this delicious tasting spinach soup. It is effortless to prepare and tastes so good. 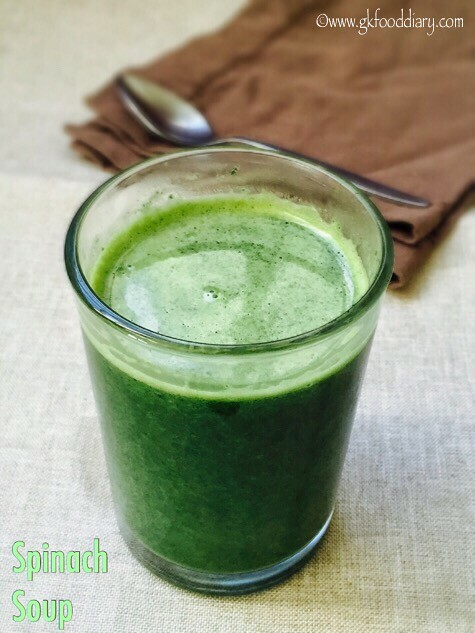 I am sure kids will not say no to this tasty spinach soup! Spinach is ideal for babies from 10 months, and this soup is best to start with when you introduce spinach. Do check out Spinach rice, Spinach Khichdi and Spinach Omelette recipes for babies and kids which I have already posted. 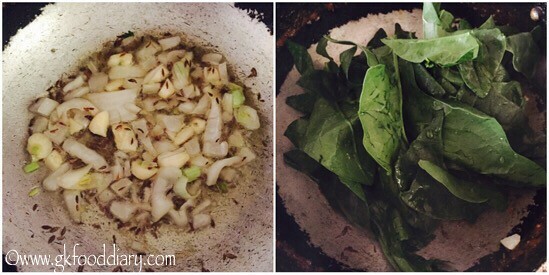 Now Let’s check how to make this easy spinach soup recipe for babies, toddlers, and kids. Wash spinach in running water well (at least twice). Finely chop onions & garlic. Keep all the other ingredients ready. Heat a pan with butter/ghee/oil and add cumin seeds. Let it crackle. Now add chopped onions and garlic together. Fry them nicely until golden brown. Now add chopped spinach along with turmeric powder and required salt. Mix well. Then Add 2 cups of water. Allow it to boil for 7-10 minutes in low, medium flame or until the spinach gets cooked thoroughly. Switch off the flame once done and cool it down. 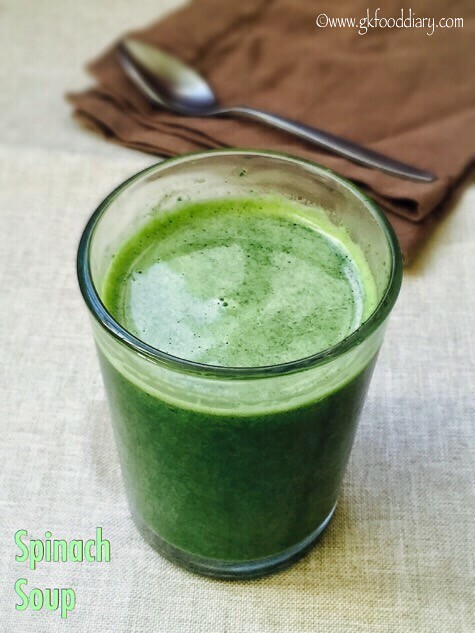 Grind the cooked spinach and everything in a blender/mixer to a smooth puree without any chunks. Filter the spinach soup using a strainer. Straining the soup is optional but recommended for small babies. Serve warm with little pepper powder. 1. Wash spinach in running water well (at least twice). Finely chop onions & garlic. Keep all the other ingredients ready. Heat a pan with butter/ghee/oil and add cumin seeds. Let it crackle. 2. Now add chopped onions and garlic together. Fry them nicely until golden brown. Now add chopped spinach along with turmeric powder and required salt. Mix well. 3. Then Add 2 cups of water. 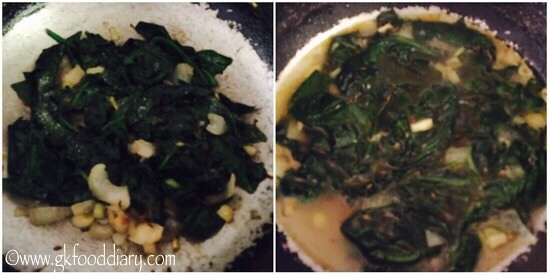 Allow it to boil for 7-10 minutes in low, medium flame or until the spinach gets cooked thoroughly. Switch off the flame once done and cool it down. 4. 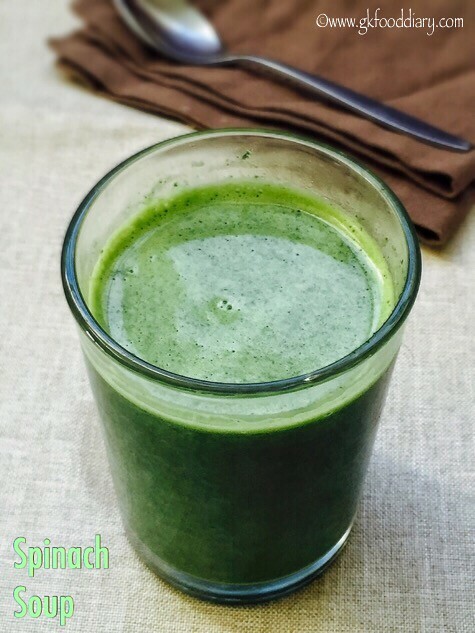 Grind the cooked spinach and everything in a blender/mixer to a smooth puree without any chunks. 5. 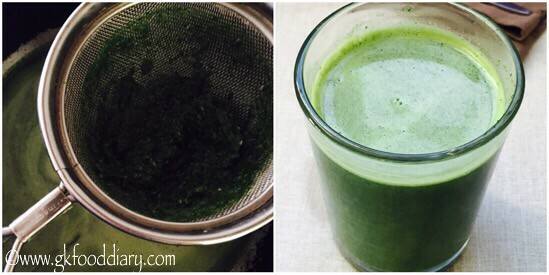 Filter the spinach soup using a strainer. Straining the soup is optional but recommended for small babies. Serve warm with little pepper powder. Healthy spinach soup is ready. Serve warm! 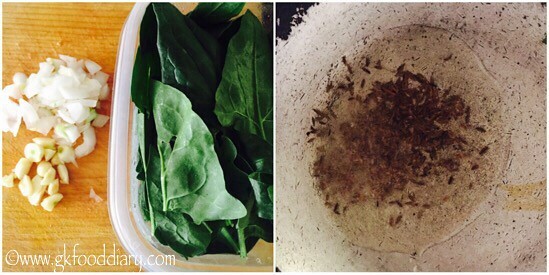 For small babies, you can strain the spinach after cooking and offer the water alone when you introduce. Adding pepper powder is optional. Add it to the soup if you want it little spicy. For babies below one year, soups should be given ocassionaly or when the baby is sick. You can use Palak/Indian spinach, amaranth leaves, baby spinach or any spinach variety to make this soup. My son is having constipation problem since birth. Doctor has advised to give him palak soup. Now he is 2years old. Let me try giving him this. I hope he likes it. He is a very poor eater!! Will update if he likes it. Thanks for the recipe. I was searching for a proper palak soup recipe for kids. my kid is having cough n running nose. it often happens to him. suggest which soup i should prefer. Mam my i have 8 months baby can i give this soup to her.